The best radio headphones, which are also known as AM/FM headphones are one of the coolest budgets out there. Just when we all thought that tuning in to local radio stations is a thing of the past because many prefer listening to their own playlist, there are still people who opt to stay old school. Besides, radio headphones are not merely for entertainment purposes; a lot of consumers are also in the search for the best radio headphones because of its functions including ear protection and built-in features that allows one to enjoy music wirelessly. There are two basic categories of radio headphones – ones that are made with hearing protection which are primarily used by professionals who work industrial jobs and are usually in a loud environment and ones that are used by AM/FM radio listeners and music enthusiasts mainly for leisure. When you work in the industrial field, construction industry or you are simply annoyed at not being able to hear the music as you mow your lawn, work in your woodshop or vacuum your home, then this type of radio headphones is meant for you. These radio headphones come with an ear protection feature that cancels the outside noise without having to increase the volume of sound that goes directly into your ears. You will usually see the Noise Reduction Rating (NRR) on the product features which allows you to know how effective and efficient the ear protection function the radio headphones can actually offer. Even if you have an extra-large music library, it will be difficult to make all the songs fit in to the storage of a regular music player or even a CD. Unless you change the files in your music player every so often, you will probably have to listen to the same songs over and over again for days. This is the reason why many still opt to have an AM/FM radio function on their headphones. Furthermore, headphones with built-in AM/FM radio allow you to enjoy music and radio shows wirelessly as you do not need a separate music player. This makes it easy for you to move around especially when you use your headphones while working, jogging or working out. When choosing the best radio headphones, you are looking for something more than just a pair that’s stylish and durable. There are certain characteristics that a pair of radio headphones should have and if you placed a check on each of the qualities listed below, then you probably found the best radio headphones for you. You are expected to wear your radio headphones for hours on end especially if you intend to use it for work. If it’s too heavy or the ear pads and headband are too hard or stiff and wouldn’t fit perfectly, you will most likely feel a sense of discomfort eventually. You should check whether the headband is adjustable, the ear pads are made with durable cushioned material and if the actual headphones are ergonomically designed for comfort fit for extended hours of use. More than just having a built-in AM/FM radio feature, the best radio headphones should also be compatible with many other devices. There are radio headphones that have a Bluetooth feature so you can listen to music wirelessly from your smartphone or tablet, an audio input so you can connect your music player and other devices through a standard audio cable and/or an SD card slot which will allow you to listen to your own dedicated playlist for your headphones. Sound quality is very important. While you probably cannot compare these radio headphones to professional headphones used by artists and music procedures, it should at least offer superior sound quality that will let you maximize enjoyment while listening to music. Some radio headphones also feature bass adjustments so you can listen to more defined beats and a crisper and clearer sound. Especially if you are looking for professional hearing protector radio headphones, volume management is essential. There are some radio headphones that provide auto adjustment and will limit the volume to a safe level. Different radio headphones operate through different kinds of batteries. The most common ones use 2 AA batteries and rechargeable lithium-polymer or lithium-ion batteries. It is a matter of preference though as you can also buy AA batteries that are rechargeable. It is good to note though that AA batteries can last anywhere from 20 to over 30 hours, some even go to as high as more than 100 hours of continuous use while rechargeable lithium batteries usually offer less than 10 hours of continuous use. Quality, performance, comfort and style – all these are combined perfectly with the RadioShack AM/FM Stereo Headset Radio which is why it goes on top of this list. Aside from the fact that it comes from the trusted brand RadioShack, what’s great about this pair of radio headphones is that it is guaranteed to be durable. 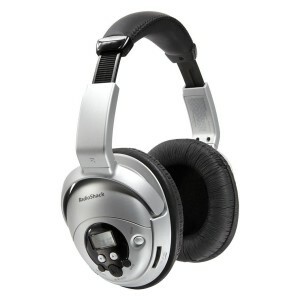 In fact, without the need to play around with different styles and models for this particular set of headphones, RadioShack was able to maintain this model’s popularity for over a decade. There are numerous users who only have great things to stay about the RadioShack AM/FM Stereo Headset Radio as they are able to use it for years without a problem. The basic features of the RadioShack AM/FM Stereo Headset Radio include 10 AM presets and 10 FM presets which are essential for those who would like to have the capability of switching from one station to another with ease. Even without an antenna, reception is picked up quite well. There’s also an LCD display so there’s no guessing of what station you’re listening to. It is simple with its black and silver color tone and fits comfortably with soft yet durable ear pads that are large enough to block outside noise. Furthermore, it has been proven by numerous customers that the RadioShack AM/FM Stereo Headset Radio picks up reception whether on AM or FM pretty well with decent sound quality too through its E-Bass function. Operating on 2 AA batteries so you can enjoy more hours of music, the MP3 feature of these radio headphones is just a bonus. Just plug in your music player using a standard 3.5mm audio cable and you’re good to go! For a pair of radio headphones at just under $100, the RadioShack AM/FM Stereo Headset Radio is definitely a great deal. 4.3 out of 5 stars from almost 3,000 reviews online prove one thing – the 3M TEKK WorkTunes Hearing Protector, MP3 Compatible with AM/FM Tuner is truly one of the best of its kind in the market. Available in wired or wireless models with around $40 difference, you’ll surely enjoy hours of radio talk shows and music with these 2 AA battery-powered radio headphones. For the sake of this post, we checked out the wired version of these black and yellow beauties. 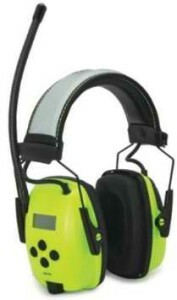 While this isn’t exactly a fashionista’s cup of tea, its design is ideal for those looking for necessary ear protection as it has an antenna and extra-large headband and protective ear muffs whichworks well for the working class individuals who always find themselves in very loud environments. 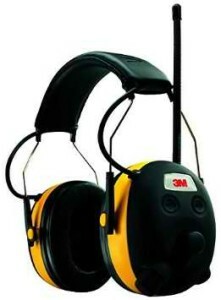 Priced at under $70 but sells at under $40, the 3M TEKK WorkTunes has an impressive Noise Reduction Rating (NRR) of 24dB. Super durable yet soft ear pads and a headband also make these radio headphones comfortable to wear even if you use it for an extended period of time. Despite its cheap price tag, 3M didn’t go cheap on the sound quality of these headphones. There are 3 Bass Boost options that allow you to customize according to your preference and an antenna for better radio reception. Among the other remarkable features are the input jack which allows you to listen to music through your own music player, an auto scan feature so you can search your preferred radio station easily, and the voice assist feature that makes controlling and programming possible even without removing your headphones. If you’re looking for the perfect bang for the buck radio headphones, this is it. Just around the 50-something dollar range, the Stanley RST-63012 puts competing brands and models at the same price bracket to shame. While it isn’t the most strikingly beautiful pair of radio headphones in the market today, its features make up for its bit of a shortcoming in the style department. With a Noise Reduction Rating of 25dB which is the best for its price range, you’re pretty sure that when it comes to protecting your sense of hearing, this pair does its job. The Stanley RST-63012 comes with striking yellow ear covers on a black body. The headband is cushioned and adjustable for a perfect fit. The ear pads are also soft and cushioned as well for a comfortable fit. Aside from its built-in digital AM/FM radio feature, it also comes with an AUX input jack so you can play music straight from your own player. The sound quality with bass enhancement is comparable to professional headphones and what’s better is that it has a Volume Management Technology that keeps the volume of the music on a safe hearing level. Because it has an antenna placed on one of the ear covers, you are guaranteed to get great reception signal on AM and FM. In fact, the Stanley RST-63012 also features an Air Flow Control Technology which helps control signal strength without requiring a larger ear cup size as compared to other radio headphones. It works with 2 AA batteries so getting a replacement after running out from use for hours and hours is quite easy. While there are cheaper alternatives to this model considering its features, the durability is what makes this item stand out. You can expect it to be of your service for many years to come. Now here’s a pair of AM/FM headphones that even a fashion-conscious teen would wear – the Levin® 3-in-1 Function Sports On-ear Stereo Earphones. Built for those who live an active lifestyle and would hate having wires get in the way of their busy schedule, these radio headphones are compatible with practically all kinds of smartphones and music players. Not only do you get to listen to your favorite radio shows, you can listen to your favorite music on the go via Bluetooth connectivity on your music player or smartphone. Available in an attractive blue color with a simple and ergonomic neckband design, the Levin® 3-in-1 Function Sports On-ear Stereo Earphones is the type of radio headphones of those who are frequently on the go. Whether you’re set to go jogging in the morning, workout in the gym, endure hours of commute or you just need to drown out your noisy surroundings while listening to good music, this is the one for you. The Levin® 3-in-1 Function Sports On-ear Stereo Earphones is more than just for music. Since it has a Bluetooth function, you can also take calls through these headphones with a single tap on the headset. What makes it a standout among other radio headphones in its price range of under $30 is its TF card function. You can just insert a memory card (up to 16GB) and start playing your favorite music. 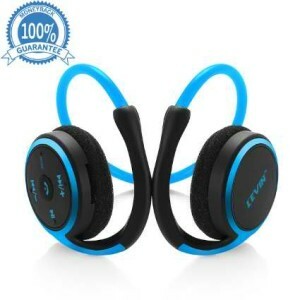 Made with durable high quality materials, very comfortable fit, multiple functions in one affordable device, good radio reception and Bluetooth connectivity plus remarkable sound quality, you are surely getting a good deal out of the Levin® 3-in-1 Function Sports On-ear Stereo Earphones. The Howard Leight by Honeywell 1010390 Hi-Vis Radio and MP3 Ear Muff sure made its way easily to get a deserving spot on this list as a pair of radio headphones that is packed with all the features one would be looking for. Unlike the usual yellow on black headphones in its range, this pair opted for a bright green color with a reflective headband for high visibility. Its LCD display makes it a breeze to choose the station you want to listen to plus 10 station presets; and the antenna helps in assuring great reception on any frequency. 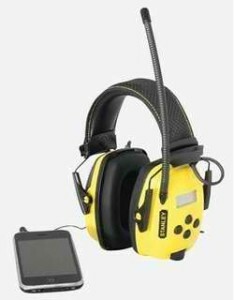 Sound quality is definitely not sacrificed in the Howard Leight by Honeywell 1010390 Hi-Vis Radio and MP3 Ear Muff. It is more than just an average pair of radio headphones as it boasts of controlled volume of up to 82 dB only. It doesn’t eat up battery life too easily as well despite of its power as each set of 2 AA batteries can already give you up to 111 hours of continuous listening pleasure. An additional feature that music enthusiasts are also sure to appreciate is its audio input jack that works with the included 3.5mm cable. You can plug in your smartphone, iPod or any music player to have a more enjoyable music experience. If the features above aren’t enough, what makes the Howard Leight by Honeywell 1010390 Hi-Vis Radio and MP3 Ear Muff even better is the comfort fit that it promises. The cushioned headband and padded ear covers which are replaceable combined with a lightweight design offers convenient and comfortable use for hours on end. Priced at under $70, it might be a bit on the pricey side compared to similar radio headphones but durability, powerful performance plus the classy design makes it worth your money. This Venstone radio headphones with Bluetooth function is probably one of the most impressive you will find style, function and quality-wise within the $30 price range. Though it only has the capability to catch FM frequencies and not AM, it has practically everything you’ll be looking for in a bang for the buck pair of headphones. The color choices include black, blue, red and white—this gives you an option to choose which one fits your style. It doesn’t require you to purchase batteries as it already has a built-in lithium ion battery that you can recharge for just a little over an hour and it will give you continuous music for up to 6 hours. If you plug in the standard 1.5m audio cable that comes with it, you can listen to music without using up battery time. There’s even a TF card port so that you can insert a memory card to listen to music. Since it has a Bluetooth function which allows you to play music wirelessly from your Bluetooth compatible devices, it also gives you the capability to answer phone calls hands-free as it has a built-in microphone. Customers who purchased the Venstone radio headphones have pointed out its remarkable sound quality which is comparable to other professional headphones that will cost you hundreds of dollars. Its design isn’t too shabby either; in fact, it is quite impressive. It is foldable so you can easily store it in a desk drawer or carry inside your bag and it is adjustable to fit all head sizes. Cushioned PU leather headband, soft earmuffs and an overall impressive look makes this Venstone an ideal pair that guarantees quality, function and comfort all at the same time. The Blue House 709B Wireless MP3 Headphones isn’t only made for the style-conscious teens of today but also for anyone who loves to listen to good music, no matter what age. For the built-in radio, it can only capture FM radio frequency which is a feature that’s good enough for many music enthusiasts. The impressive thing about this though is that it comes with a 4GB memory card where you can store up to 25 hours of music – that’s equivalent to more than just a couple of hundred songs depending on the file size. 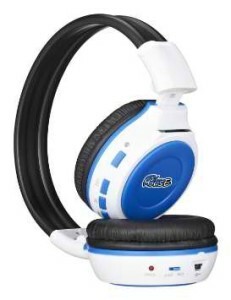 You don’t need to buy batteries for the Blue House 709B Wireless MP3 Headphones with 4GB Memory Card FM Radio. In fact, many customers who purchased this are impressed by the fact that the 9-hour battery life works as advertised and sometimes, it can even go beyond that. You can basically enjoy an entire day of music wirelessly without getting cut off in the middle of your favorite song due to battery running out. 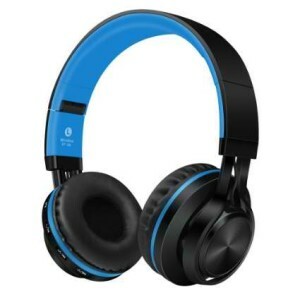 Priced at under $40, one can definitely say that the Blue House 709B Wireless MP3 Headphones is great value for money. While it doesn’t have as many features as other radio headphones in its price range, the sound quality and the impressive battery life as well as the ability to store your own playlists on the SD card that’s included in the package very well makes up for its few shortcomings. Furthermore, it is lightweight and designed to fit most head sizes comfortably. Recently, Blue House even upgraded its ear cushions to make it more comfortable and durable to last years of enjoyment. It’s amazing how Beyution managed to lower down the price of the New Beyution 512 White Bluetooth V3.0 headphones from almost $100 to just over $20. If there’s an affordable pair of radio headphones that has all the functions any music enthusiast would need, this is definitely the best choice. The New Beyution 512 White Bluetooth V3.0 headphones boast of three functions – FM radio, microSD card reader and Bluetooth with microphone. It is great that you can listen to your favorite radio shows through its FM radio function which does pretty well in getting clear reception from all frequencies. You can also create your own playlist dedicated only for this pair of headphones as you can store the music on a microSD card and simply insert it directly to its slot. The Bluetooth function doesn’t only let you enjoy music straight from your smartphone or music player through Bluetooth connectivity, it also lets you receive calls and talk to the person on the other line as it has a built-in microphone. It works with pretty much all kinds of smartphones, Android and Apple tablets and music players, laptops and computers. You can also use a 3.5mm audio jack for wired connection to play music from other non-Bluetooth devices. Design-wise, any fashion-conscious individual will surely appreciate the New Beyution 512 White Bluetooth V3.0 headphones. It has an ergonomic design with cushioned ear pads and sturdy headband for a comfortable fit. It is durable enough to last through years of enjoyment! 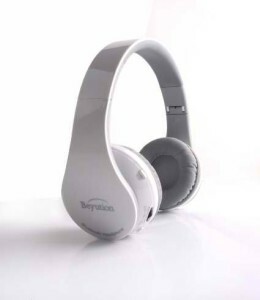 Considering its low price, the New Beyution 512 White Bluetooth V3.0 headphones is impressive enough to have a built-in lithium-polymer battery that’s rechargeable and would last for up to 7 hours of continuous use. Noise reduction rate of up to 15 dB plus impressive sound quality combined with all the remarkable features mentioned above truly does give this Beyution radio headphones a deserving spot on this list. The OPD Digital AM/FM Radio Earmuffs Headphones doesn’t just look tough; it is indeed durable and is meant to last for years of service to any music enthusiast. This pair of radio headphones is meant for those working in a rather loud environment such as industrial workers, construction professionals and more. It is effective in reducing noise with a Noise Reduction Rating of 24 dB which makes it great for those who are doing woodwork, mowing the lawn or those who are in noisy construction job sites. It comes with an attached antenna for better reception of AM and FM frequencies and it also allows you to save up to 8 presets of radio stations. Furthermore, there’s a LED screen that lets you see what’s playing. The OPD Digital AM/FM Radio Earmuffs Headphones may have the standard work headphones look that are quite similar to other models but what makes it standout is its super durable cushioned stainless steel headband that can be adjusted to fix most head sizes. It also has foam cushions for the ears for utmost comfort for those who use these for hours on end. You can also play music straight from your own music player or smartphone as it includes a 3.5mm audio cable that you can plug into the headphones. Powered by 2 AA batteries, you can expect hours of continuous music with your OPD Digital AM/FM Radio Earmuffs Headphones without interruption. Considering its impressive sound quality and durable build, priced at under $40, this is definitely a practical choice. 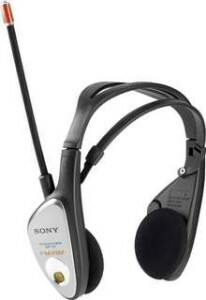 Sony has been one of the leading brands when it comes to radios all over the world for years. When Sony comes out with a new product, it is always expected to be an impressive one. The Sony SRFHM55 Sports Walkman AM/FM Stereo Headphone Radio proves to be a great addition to the list of Sony’s impressive products. Aside from the fact that this is a Walkman which is known to last for years of usage without problems, this pair of the best radio headphones looks quite stylish too. The Sony SRFHM55 Sports Walkman AM/FM Stereo Headphone Radio is water-resistant and this feature is probably the reason why it stands out among others. Made with durable high-impact plastic, this pair of headphones is ideal for runners and those who are exposed to a lot of sweat, dirt and moisture at work. 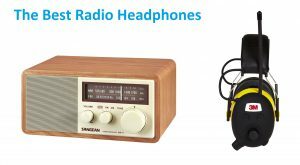 Radio signal is quite good too and you won’t have any problem tuning in to your preferred AM or FM station since it has a flexible antenna with light reflector and digital synthesized tuning. It protects your hearing too with its auto volume limiter that also enables minimizing distortion while giving you superior sound quality. It fits comfortably and securely with its adjustable headband and as a bonus, it has a built-in clock that shows remaining battery life as well. 2 AA batteries are used as power source.